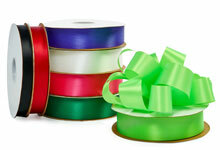 Affordable Printed Ribbon - We print it right here! 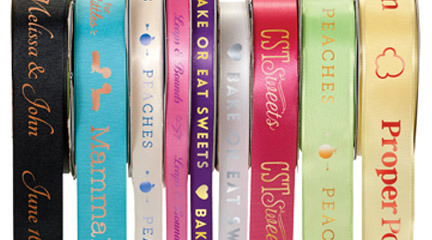 Nashville Wraps has a huge inventory of in-stock satin ribbons that simply look great when printed. Printing your logo is creating brand awareness and we do all of that for you right here in our state of the art in-house printing facility. We have the resources, the people and the patience! Our custom printing specialists are knowledgeable, friendly and eager to assist you. They can answer all your questions and help you with every part of your order. Provided we have the plain ribbon you want in-stock (and we usually do) and since we do everything right here our lead time averages 10 regular working days (or less) after final art approval. New orders usually take additional time but typically no more than a week to get the art completed and approved by you. Note: Prices above are printing only and do not include the cost of ribbon. Prices are per 100 yd rolls with the exception of #9 Double Face which is 50yds per roll. Minimum order is 2 rolls and must be the same size. Additional rolls printed are ordered in multiples of 2 rolls per size. Different stock ribbon colors are allowed. Price breaks are based on using the same image and imprint color. 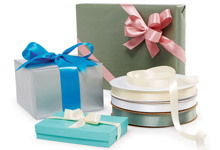 Different stock ribbon colors are allowed on any order. You may change the print color within a order of 4 rolls or more roll with a $10 color change or with an order of 8 rolls or more for free. The minimum quantity for a print color change within any order is 2 rolls. Prices shown are printing only and do not include the price of the unprinted ribbon. 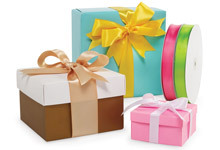 Quantity prices allow for the combination of different sizes of ribbon, however the minimum for any single size of ribbon is 2 rolls and must be ordered in multiples of 2 rolls. We use hot stamp printing for top quality. Click here for available Hot Stamp colors. You may change the print color within a order of 4 rolls or more roll with a $10 color change. Printing dies (plates) are required for any new or changed order and certain reorders. We offer permanent magnesium dies. For custom logos, more text, longer ribbon runs, or frequent reorders, a permanent die is used. For text and logos under 8" in width, these dies are $75. We can use the same die for #3 and #5 ribbon providing the image size does not exceed the maximum for the #3 ribbon. All #9 ribbons require a separate die. Permanent dies are stored for a maximum of 2 years from time of last use. Die prep includes minimal typesetting and logo placement but does not include extensive artwork. The print area is subject to the guidelines show below. Note: The edges of the ribbon (1/8" on all sides) are non-printable. Two-color (or more) imprints are available on a special quote basis. Print placement can vary, but is typically 2 repeats per linear foot of ribbon.